This type of isomerism arises from the difference in the structure of carbon chain which forms the nucleus of the molecule. It is, therefore, named as chain, nuclear isomerism or  Skeletal isomerism. For example, there are known three pentanes which have the same molecular formula (C5H12) but differ in the structure of the carbon chains in their molecules. While n-pentane has a continuous chain of five carbon atoms, isopentane and neo-pentane has  branched chains. These chain isomers have somewhat different physical and chemical properties. This kind of isomerism is also shown by other classes of compounds. Thus n-butyl alcohol and isobutyl alcohol having the same molecular formula C4H9OH are chain isomers. It may be understood clearly that the molecules of chain isomers differ only in respect of the linking of the carbon atoms in the alkanes or in the alkyl radicals present in other compounds. It is the type of isomerism in which the compounds possessing same molecular formula differ in their properties due to difference in the position of either the functional group or the multiple bond or the branched chain attached to the main carbon chain. For example, n-propyl alcohol and isopropyl alcohol are the positional isomers. In the aromatic series, the disubstitution products of benzene also exhibit positional isomerism due to different relative positions occupied by the two substituents on the benzene ring. 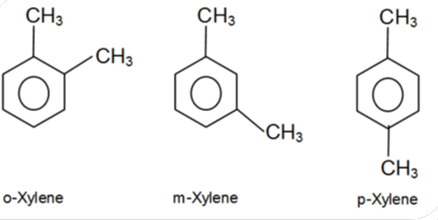 Thus xylene, C6H4(CH3)2, exists in the following three forms which are positional isomers. Diethyl ether ( C2H5–O–C2H5) and butyl alcohol(C­4H9–OH) both have the molecular formula C4H6O, but contain different  functional groups.The functional group in diethyl ether is (–O–), while is butyl alcohol it is (–OH). Acetone(CH3–CO–CH3 )  and propionaldehyde( CH3–CH2–CHO) both with the molecular formula C3H6O are functional  isomers. 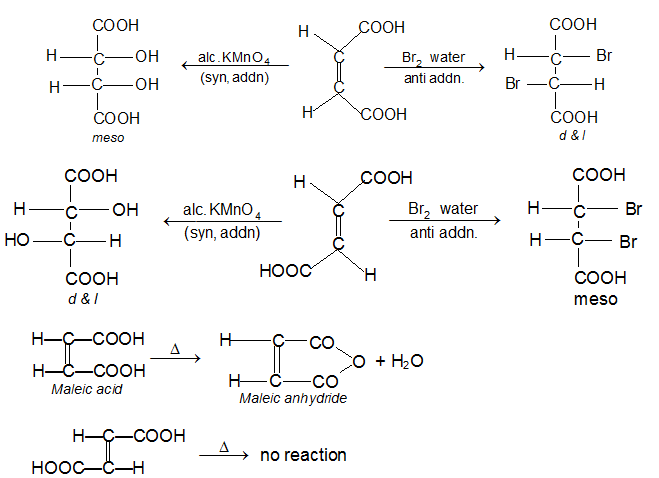 In acetone the functional group is (–CO–), while in acetaldehyde it is (–CHO). Carboxylic( R-COOH) acids are isomeric with esters (R’-COOR”). Sometimes a double bond containing compound may be isomeric with a triple bond containing compound. This also is called as  functional isomerism. Thus, butyne is isomeric with butadiene (molecular formula C4H6). Primary,secondary and tertiary amines of same molecular formula are also the functional isomers. Such isomers in which one is cyclic and other is open chain, are called ring-chain isomers. Alkynes and alkadienes are isomeric with cycloalkenes. In methyl propyl ether the chain is 1 and 3, while in diethyl ether it is 2 and 2. This isomerism known as Metamerism is shown by members of classes such as ethers, and amines where the central functional group is flanked by two chains. The individual isomers are known as Metamers. Out of the two tautomeric forms, one is more stable and exists in larger proportion. In above, normally 93%  of the keto form (more stable) and only 7% of the enol form (less stable i.e. labile) exist. this type of tautomerism is known as keto-enol tautomerism. It is the most commonly observed type of tautomerism. Keto-enol tautomerism is generally observed in those compounds in which either a methyl (CH3—), methylene (—CH2—), or a methyne  (>CH-) group is present adjacent to a carbonyl (—CO—) group as in acetoacetic ester above. In other words, it can be said that keto-enol tautomerism is possible in only those carbonyl compounds in which atleast one a-hydrogen atom is present so that it may convert the carbonyl group to enol group. CH3COCH2COH3 has about 75% enol content. Moreover, the enol form shows acidic  nature due to the tendency to liberate proton(H+) from the enol (> C—OH) group. This H is the a-hydrogen in keto – form. Therefore, -H in carbonyl compound is acidic in nature. More the enol content, more is the acidic nature of a-hydrogens in a carbonyl compound. Thus above is also the increasing order of acidity of a-hydrogens. An interesting observation about the enol content in acetoacetic ester is the fact that above mentioned percentage ratio (93:7) is in its aqueous solution. In liquid state this ratio is nearly 25 : 75. It is because in liquid state the enol form is much stabilised by intramolecular H-bonding. A hydroxy group attached to a carbon which is itself attached to another carbon atom by a double bond is known as enolic (en for double bond, ol for alcohol). Its nature becomes acidic as in phenol and unlike OH group in alcohol which is neutral or only very slightly acidic (C2H5OH + Na →  C2H5ONa + 1/2H2). In the above two examples migration of a proton from one carbon atom to another takes place with simultaneous shifting of bonds. 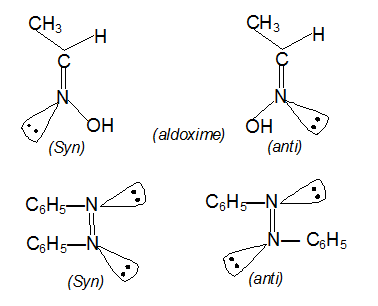 Hydrocyanic acid, H – CN and Isohydrocyanic acid H — NC are also tautomeric isomers or tautomers. In tautomerism, an atom changes place but resonance involves a change of position of pi-electrons or unshared electrons. Tautomers are different compounds and they can be separated by suitable methods but resonating structures cannot be separated as they are imaginary structures of the same compound. Two tautomers have different functional groups but there is same functional group in all canonical structures of a resonance hybrid. Two tautomers are in dynamic equilibrium but in resonance only one compound exists. Resonance in a molecule lowers the energy and thus stabilises a compound and decreases its reactivity. But no such effects occur in tautomerism. In resonance, bond length of single bond decreases and that of double bond increases e.g. all six C—C bonds in benzene are equal and length is in between the length of a single and a double bond. Resonance occurs in planar molecule but atoms of tautomers may remain in different planes as well. The isomers which differ only in the orientation of atoms in space are known as stereoisomerism. It’s of two types. Geometrical isomerism: Isomers which posses the same molecular and structural formula but differ in arrangement of atoms or groups in space around the double bonds, are known as geometrical isomers and the phenomenon is known as geometrical isomerism. Geometrical isomerism are show by the compounds having the structure. Cis – trans isomerism: When similar groups are on the same side it is cis and it same groups are on the opposite side it is trans isomerism. Syn anti isomerism is not possible in ketoxime since only one from is possible two —CH3 groups are at one C.
Dipolemoment : Usually dipole moment of cis is larger than the trans-isomer. Melting point: The steric repulsion of the group (same) makes the cis isomer less stable than the trans isomers hence trans form has higher melting point than cis. Any substance which rotates the plane polarised light (PPL) is said to be optically active. If a substance is optically active, it is non - superimposable on its mirror image. If a molecule of substance is superimposable on its mirror image, it cannot rotate PPL and hence optically inactive. The property of non-superimposability on mirror image is called chirality. The ultimate criterion for optical activity is chirality , i.e., non-superimposibility on its mirror image. If a molecule of organic compound contains 'one' chiral carbon, it must be chiral and hence optically active. Chiral carbon: If all the four bonds of carbon are satisfied by four different atoms / groups, it is chiral. Here it should be noted that isotopes are regarded as different atoms / groups ) chiral carbon is designated by an asterisk(*).